First off, we are not evil, we Specialize in online marketing, take for example our name "Sinister Sites"; out of every web design or online service company you look at, you will remember that name "Sinister Sites" over let's say (generic name) marketing or Joe (name)'s websites. And this is the level of thought that we put into all our services. Next we provide all services that you will need to make your business or idea as popular and profitable as the internet will allow. We will help you maximize your exposure on your website on search engines (that's called S.E.O.) and create the most visually appealing site possible. Also we handle all Social media, maximizing exposure to potential clients and consumers in the location (or locations) that you are operating in. And after that we deal with advertising, both pay per click (PPC) and pay per view (PPV), and maximizing your campaign to be as profitable as possible. Finally, we handle graphic design. Sounds like an out of place add on, but with the nature of online marketing and creating websites, online Ads and images for social media; we have become very artistic, and can create any symbol or logo that you would need, like our logo at the top of the page. 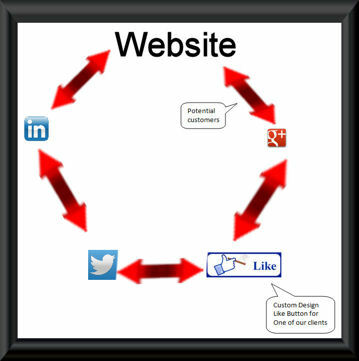 -Nowadays websites need more then just a good looking website, you need social media also. 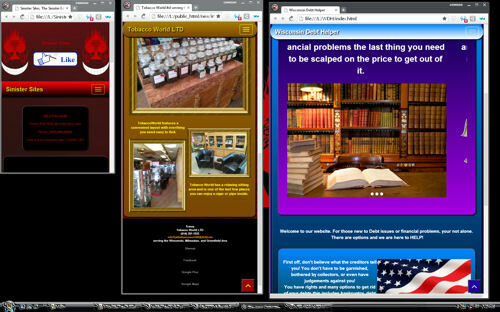 We have devolped a method that we called the Wheel, bascilly the website, and all socail media promote eachother, maximizing you web exposer.